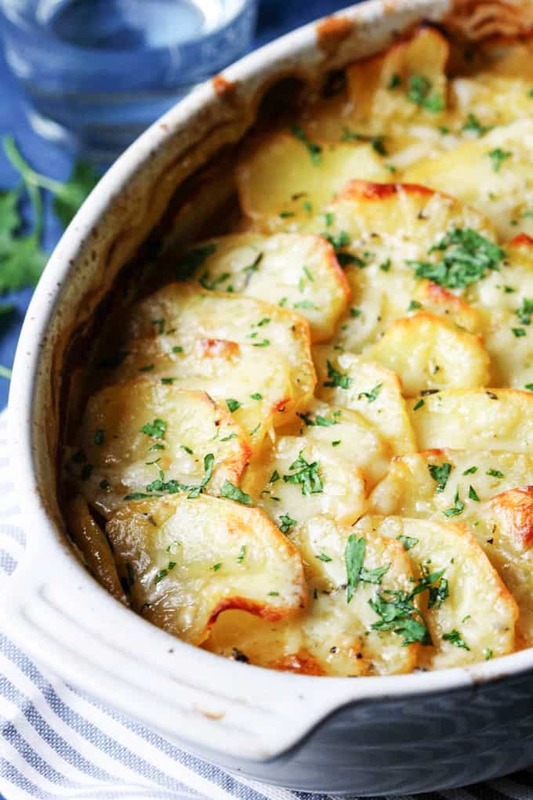 Boulangere Potatoes makes for an amazing casserole type of dish that combines thinly sliced potatoes, sautéed sliced onions, garlic, and butter. 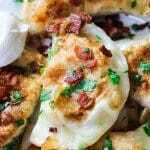 They are then covered in a flavorful stock and baked in the oven to achieve a soft buttery potato inside, with a bit of crunch on the outside. 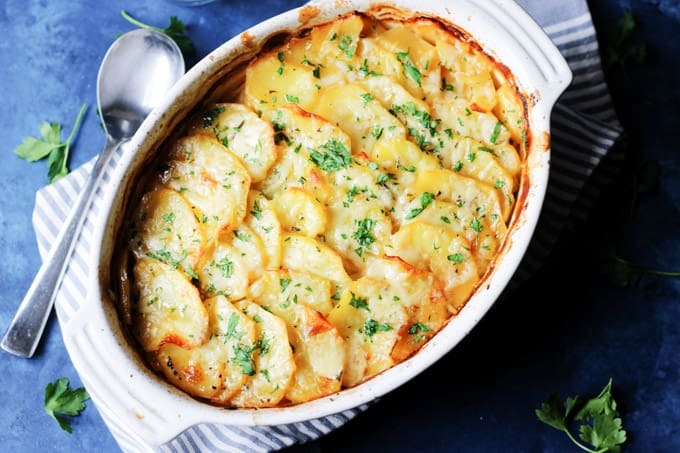 I partnered up with Idaho® Potatoes Commission to bring you this amazing Boulangere Potatoes recipe with the best Idaho® Potatoes. Centuries ago, in rural areas, people didn’t have their own ovens in their homes. Instead, they would prepare a Sunday roast lamb and a potato casserole dishes and then take them into the local baker. While the dishes were cooking at the bakery, the cooks would then go to church to pray. They’d then pick up their cooked meals on their way home. Isn’t that interesting? When it comes to Easter dinner in the United States, it seems like there are two traditional meat dishes: spiral ham or leg of lamb. 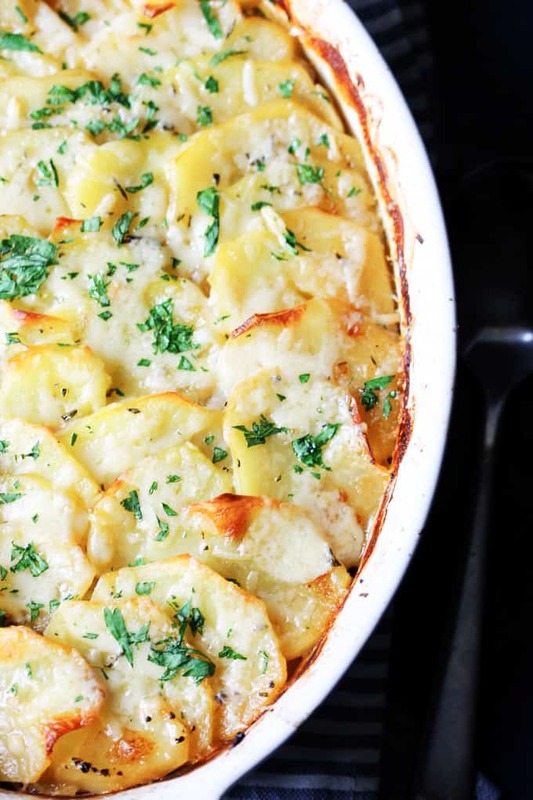 But when it comes to a side potato dish, it seems like some kind of potatoes au gratin (or casserole) is the go-to dish. 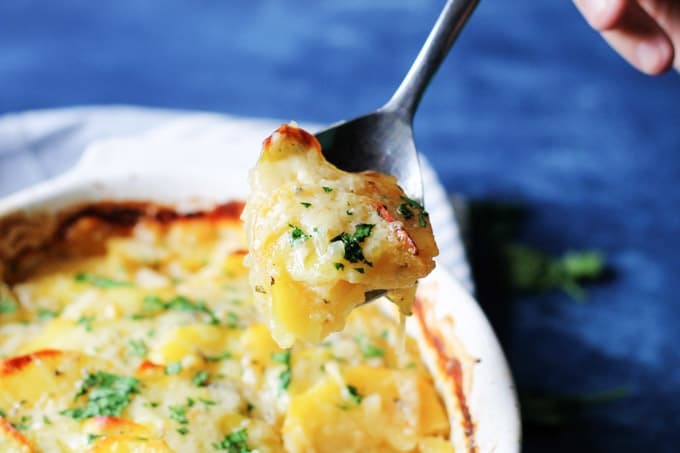 In fact, I have one of these recipes in my repertoire: Potato and Leek Gratin Casserole (also known as Dauphinoise), and I absolutely love it. But here’s the catch… Usually, on occasions like Easter (or other Holidays) the festivities last for a long time. It starts with breakfast, then lunch, then appetizers and then the main course. All of this spells a lot of consumption throughout the entire day. When you serve a potato casserole (that’s pretty heavy), I’ll bet you won’t be able to indulge much (within the confines of your pants that is). So, this recipe for Boulangere Potatoes is a substitute you may need. It is much, much lighter then au gratin, as it’s cooked in a broth and not in a cream. It also has just a little sprinkle of cheese on top and not copious amounts of cheese throughout. That’s a win-win situation. You have a potato casserole, but much lighter, yet super delicious! Therefore you can indulge as much as you want and not have to worry about unbuttoning those pants. Oh, and I almost forgot to mention, this recipe is super easy to make. You can see step by step instructions below. 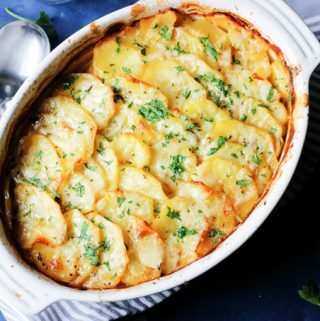 For this Boulangere Potatoes recipe, I used Idaho® Yukon Gold Potatoes because of their buttery flavor and moist texture. To be sure you’re getting genuine, top-quality Idaho® Potatoes, look for the “Grown In Idaho” seal. Idaho’s growing season of warm days and cool nights, ample mountain-fed irrigation, and rich volcanic soil, give the Idaho® Potatoes their unique texture, taste and dependable performance. If you’re interested in learning more about Idaho® Potatoes, check my post for Greek Lemon Potatoes where I also talk about the nutritional value of the Idaho® Potatoes. And that recipe is pretty spectacular too. The preparation of these Boulangere Potatoes doesn’t take that long (maybe 15 minutes, tops). The oven does the rest for you. Here’s what you’ll need to do. Slice up the onions and sauté them for 5 minutes with a little butter. Then add the garlic with some more butter and sauté for another 5 minutes. In the meantime, peel your potatoes (tip: do not wash them, you don’t want to rinse off the starch) and cut them thin (I used my food processor to cut up 2/3 of my potatoes, which literally took 15 seconds. I then thinly sliced 1/3 of potatoes to have nice round slices for the top layer. If you’re less concerned about making it all pretty, just use a food processor. You can also use a mandoline to thinly slice your potatoes). Butter your 11″ oval baking dish and start assembling the casserole. Add 1/3 of your potatoes for a single layer; then add 1/2 the onions, 1/3 of your rosemary, salt, and pepper (season every layer). Pour over the stock so it submerges almost all of the potatoes. However, the top layer stays slightly elevated above the stock (so that it will get crispy). Add more rosemary, salt, and pepper. Add little pieces of butter (1/3″ squares) on the potatoes and drizzle with extra virgin olive oil. Take the foil off and bake for another half hour. In the meantime shred 1/2 cup of Gruyere Cheese and chop parsley. Remove the potatoes from the oven, sprinkle with cheese and return to the oven for 5 minutes, until the cheese has melted. For more recipes (there are A LOT of good ones), and all the tips, information, nutritional values visit the Idaho® Potatoes Commission website. 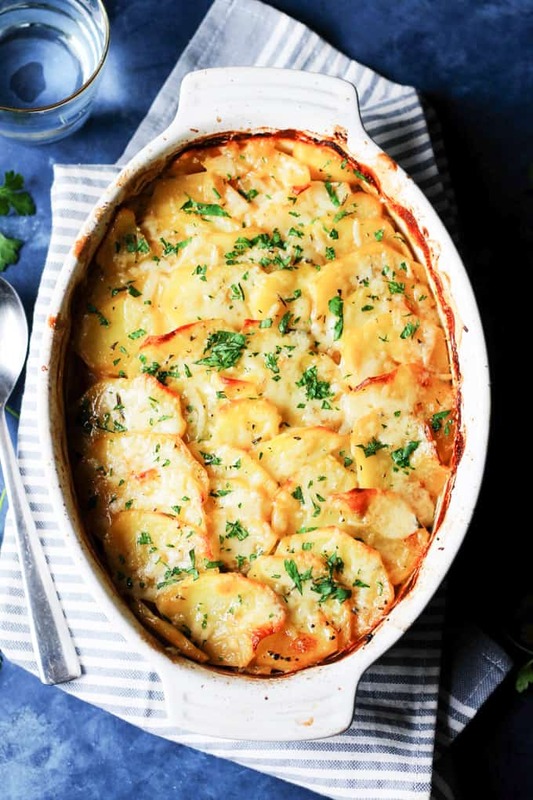 Boulangere Potatoes makes for an amazing casserole type of dish that combines thinly sliced Idaho® Yukon Gold Potatoes, sautéed sliced onions, garlic, and butter. They are then covered in a flavorful stock and baked in the oven to achieve a soft buttery potato inside, with a bit of crunch on the outside. Slice up the onions, add 2 tablespoons of butter to the skillet and sauté them for 5 minutes. Then add the garlic with one more tablespoon of butter and sauté for another 5 minutes. In the meantime, peel your potatoes and cut them thin (I used my food processor to cut up 2/3 of my potatoes, which literally took 15 seconds. I then thinly sliced 1/3 of potatoes to have nice round slices for the top layer. Butter your 11" oval baking dish and start assembling the casserole. Take the foil off, raise the oven temperature to 425F and bake for another half hour. In the meantime shred 1/2 cup of Gruyere Cheese and chop the parsley. Do not wash your potatoes, you don't want to rinse off the starch. Using a food processor to slice the potatoes will save you a lot of time. However, the slices may not come all even. This doesn’t matter for the first two layers but you may want to have even slices of potatoes for the top layer to make a beautiful arrangement of slices slightly overlapping on each other. In order to do so, you may use a food processor for 2/3 of your then use a knife to slice the remaining potatoes for the top layer. You can also use a mandoline to thinly slice your potatoes instead of food processor or knife. 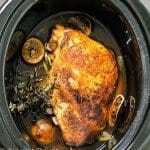 Instead of vegetable or chicken stock, you can use chicken concentrate or bouillon dissolved in water for more flavor. You listed all of my favorite things in that first sentence! These potatoes look absolutely incredible. I love that color and all the cheese. My mouth is watering! These will be perfect for Easter and thanks for the great progress photos as well. This is a delicious recipe idea for potatoes. So many gorgeous flavours and perfect for a family meal. 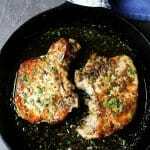 This is a very smart and AMAZING recipe! Great instructions and creativity. 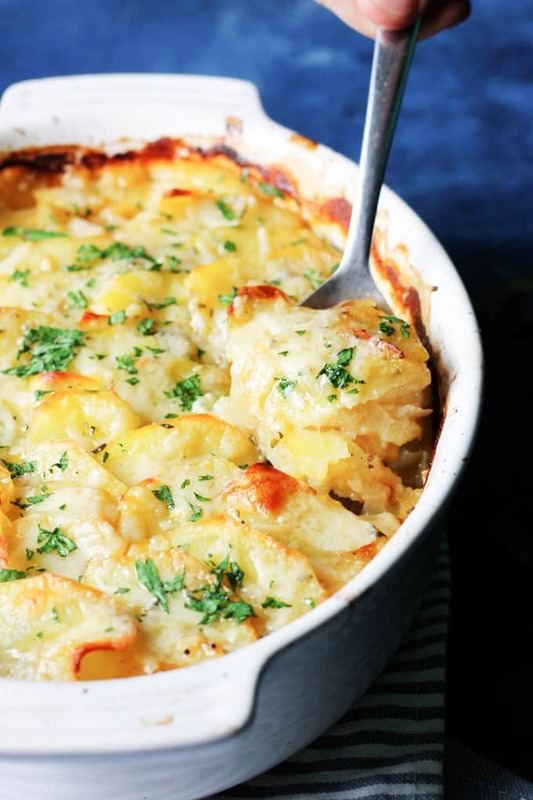 I LOVE everything that is associated with potatoes, and I can not wait to try this recipe. Now these potatoes look super inviting. I just had lunch and now I am hungry again! Loving the way you clicked them. Lovely & mouthwatering. Sound like great. Can’t wait to try this out. Keep this up.